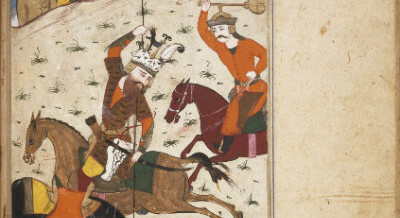 Roj Hormazd Mah Shehrevar, 1384 Yz. Roj Rashne Mah Bahman, 1383 Yz. As the soldiers hunted for Raksh, Rostam was plied with wine and the best of dishes by a bevy of beauties from the King’s court. Having had the fine wine and food and tired by the day’s exertions, Rostam soon drifted off to sleep in his guest quarters. Roj Ava Mah Bahman, 1383 Yz. Kamar basto tarkash puraz tir kard! Kunum razme Sohrabo Rostam shanavDegarha shanidasti in ham shanav. Now listen about the battle of Sohrab and Rostam, you may have heard other accounts, but now listen to this one.This story is most sorrowful and hearing it, your tender heart will bear enmity towards Rostam. Roj Ram Mah Adar, 1383 Yz. Beyaamad sue Pars Kaus-e KaiJahaani bashaadi nav afgand pay! Kai Kaus returned to Pars and laid the foundation of happiness and justice. Roj Gosh Mah Adar, 1383 Yz. Kazaan pas chunaan kard Kaus ray; Ke dar Padshahi be-jumbai ze jay! Az Iran beshud taa ba-Turaan-o Chin; Guzar kard azaan pas ba Makraan zamin! Ze Makran shud aaraastah taa Zareh; Meyaanhaa nadeedand bando gereh! Paziroft har mehtari baazo saav; Nakard aazmun gaav baa shir taav! Then Kai Kaus thought that he should tour the regions of his Kingdom. From Iran he went to Turan and China and from there to Makran (Baluchistan). Roj Bahman Mah Avan, 1383 Yz. On the occasion of the Fasli Gathas, a five-day series of lectures has been organized at the Mahella Patel Agiary, Grant Road since more than 20 years. Yesterday, 16th March 2014 was the First Fasli Gatha. On this ocassion I spoke on the Life Story of Ruzbeh bin Muqaffa – a true Zoroastrian martyr. Roj Aneran Mah Tir, 1383 Yz. To jaano tane bazenhaar daar! Roj Govad Mah Khordad, 1383 Yz.